As the story opens, we are introduced to Matthew and Marilla Cuthbert, unmarried siblings who live on their ancestral farm in the rural town of Avonlea, Prince Edward Island in Canada. Matthew is now 60 years old and unable to properly work the farm, Green Gables. Matthew and Marilla decide to adopt and orphan boy to help them on the farm. The town gossip, Mrs. Rachel Lynde, is shocked to find out that Cuthberts have adopted a boy since she believes they are fit to raise a child. Matthew goes to the train station to get the boy, but he is shocked to find a girl instead. Matthew, it seems, is terrified of women. The orphanage mistakenly sent 11-year old Anne Shirley instead of the boy. The girl wins Matthew over with her charming spirit and talkative nature. Matthew confesses to Marilla that he wants to keep the girl. Marilla is reticent at first, but after a short time decides that Anne can stay. Anne is talkative and good-natured girl even though she has come from a place of real poverty and deprivation. However, she is not graceful in the social world, having missed out on these lessons, and she is not well-educated. She seems to compensate for this with her lively imagination and generous spirit. Since Anne tends to act according to her intuition rather than the strict codes of social manners, she often behaves in ways that do not appear befitting a young lady. She attends church wearing wreathes of wild flowers. She lashes out at Mrs. Rachel for making fun of her red hair. Although Anne does try to adhere to the rules of conduct laid down by Marilla, she nevertheless makes mistakes. She uses the wrong ingredients for making vanilla cake. She lets a mouse drown in the plum pudding. She even makes and attempt at delivering a prayer before bed, but it ends up being rather ridiculous. Anne makes up imaginary friends since she has never really had any playmates. While she is living at Avonlea, she meets Diana Barry whom she instantly befriends. Anne invites her new friend to Avonlea and mistakenly gives her red current wine instead of the non-alcoholic raspberry cordial. Diana returns to her home completely drunk and Diana’s other forbids her to ever spend time with Anne again. This separation lasts for quite some time until Anne saves Diana’s sister. After this, Diana’s mother finds it in her heart to forgive her. When Anne is sent to school, she finds a nemesis in Gilbert Blythe who taunts her, calling her carrot, and pulls her red braid. Anne retaliates by screaming at him and smashing a slate over his head. From this point on, the two are a rivalry. They are the most intelligent students, and this rivalry lasts until the end of the novel. As she matures, Anne loses some of her childish impulsiveness. She becomes less of a romantic and begins to turn her attention toward academic pursuits. Once of her teachers, Miss Stacy, recognizes Anne’s potential. Miss Stacy encourages Anne to join a group of students who are preparing to take the entrance exam of admittance into Queen’s Academy. This leads to something of a change in her long-standing rivalry with Gilbert Blythe. After nearly four years of mutual silence, they go off the Queen’s Academy together. Anne is driven to make Matthew and Marilla proud of her. She studies diligently and eventually earns the prestigious Avery Fellowship. This will give her enough money to study at a four-year college beginning the following fall. 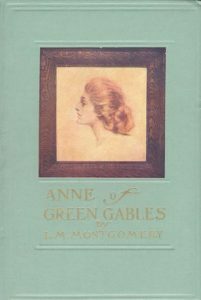 Anne is excited to tell Matthew and Marilla the news and rushes home to Green Gables. Matthew, who has previously struggled with heart problems, dies of a heart attack. Anne also learns that Marilla is going blind. With this, she decides to sacrifice her prospects at college and stay at Green Gables. When Gilbert hears of all of this, he gives up his post as teacher at Avonlea school so Anne can have a position close to Marilla and home. Gilbert and Anne, after nearly five years of rivalry, begin to forge a close relationship. Although her future appears set and rather narrow, she remains optimistic and cheerful.